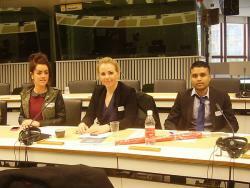 Students from Bangor University’s Business and Law Schools have visited some of the key institutions of the European Union and the Council of Europe thanks to sponsorship from Jill Evans, Welsh Member of the European Parliament. Belinda Bambrick (Law), Kateryna Vlada (Law) and Hans Seesarun (Business) listen to presentations by the Committee of the Regions and the Economic and Social Committee in the Delors building, Brussels. Students from the two schools united for this unique and long-running field trip, which aims to provide students with a better understanding of the roles of the various institutions of the European Union and the Council of Europe, to see how they interact with the key institutions and domestic law of the UK, and to demonstrate first-hand how the disciplines of law and business influence each other. 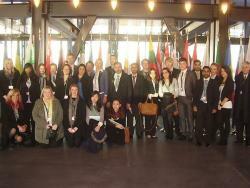 Led by Brian Jones, Lecturer in Strategic Management and Public Administration at Bangor Business School and Evelyne Schmid, Lecturer in International and European Law at the Law School, the excursion is offered annually to undergraduate students taking the ‘Britain and the EU’ or ‘European Union Law’ modules. 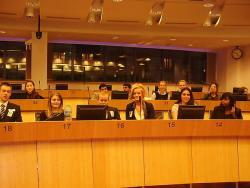 The students’ political tour of Europe began in Brussels, where they visited the European Commission, the Committee of the Regions, the Economic and Social Committee and the European Council. Next stop was Luxembourg, where the group were able to meet with Bangor Law School alumnus Thomas Seligmann, who himself attended the field trip last year and is now working for Amazon at their Luxembourg offices. The following day offered a visit to the European Court of Justice, where the students were briefed on a case and met Judge J. Azizi and Legal Secretary Students listen to presentations in the Delors building, Brussels, in a typical setting for meetings of the advisory committees of the European Union.Mr C. Zatschler. Later that evening, the group stopped off at the European Parliament in Strasbourg, where they met sponsor Jill Evans and sat in on a parliamentary session. Strasbourg is also home to the European Court of Human Rights of the Council of Europe, where the Bangor cohort had the privilege of attending the reading of the judgment in Khaled al-Masri v. Macedonia. This was a major case in which Macedonia was ordered to pay 60,000 Euros compensation to German citizen al-Masri after he was arrested, tortured and handed over to the USA, where he was the innocent victim of months of ill-treatment at the hands of the CIA. “This was the first case in which a European state was held accountable for involvement in covert operations by the US in the context of anti-terrorism measures take after 9/11”, explained Evelyne Schmid. This was followed by a visit to the Council of Europe main building, where they were welcomed by Spokesperson and Head of the Press Division Alun Drake, with the trip concluding in style in Paris. A long list of other speakers welcomed the students to the continent, including Mark Corner, a member of the speaker team at the EU Commission; The group visit the European Court of Justice in Luxembourg.Jean-Pierre Faure from the European Economic and Social Committee; Kristien Michoel, Legal Advisor at the Council of the EU; and Aysegul Uzun-Marinkovic, lawyer at the European Court of Human Rights. “This collaboration between the Business and Law Schools makes it a richer experience for both groups of students, and we are already planning the study visit for 2013”, added Mr Jones.